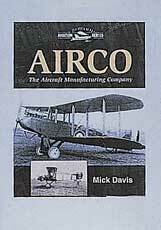 Airco played a crucial role in WWI air war, producing aircraft designed by Geoffrey de Havilland. Book describes the D.H.2, a fighter that countered the Fokker EIII, and the D.H 4 and D.H. 9, two-day bombers that offered an unmatched combination of speed, load carrying, and defensive capability. The D.H. 4 carried on as the core of the U.S. Army Air Service's bombing capability well into the 1920s. 192 pgs, HB, 8.5 x 11, 200 b/w photos.